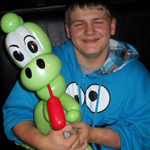 Make your late night graduation party more fun than anyone dreamed it could be! For every after prom, safe and sane event, or late night graduation party, having great entertainment is a necessary ingredient to a successful event. About Faces has all kinds of entertainment options available! 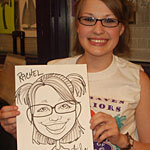 Caricature artists are one of the most popular forms of entertainment! Not only are they fun to watch, but attendees can walk away with a souvenir from the event. 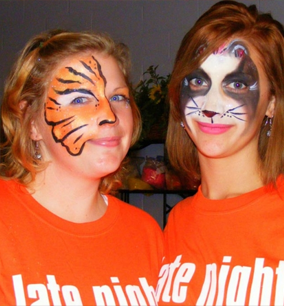 With colorful palettes to choose from, Face painters can create any school mascot or logo to show off school pride. Balloon twisters make colorful creations that will help kids remember that they are still kids, and our Fortune tellers can tell your graduates what the future holds in store for them. Henna artists can create simple, fun designs or more elegant traditional tattoos. 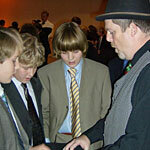 Magicians and Jugglers can wander through the event and entertain students that are waiting in line. Captivating Caricature Artists – Great for Late Night Grad Parties! From caricature artists to balloon sculptors, fortune tellers to stilt walkers, and everything in between, our entertainers are sure to make any campus event a memorable one. Whatever your occasion, we’ll help make it a success! If you would like information on a type of entertainment that is not mentioned, please contact us! There is no limit to how many entertainers you can book! Provide us with a bit of information and we'll contact you right back! "I headed the venue in Boston for the Greely Graduates on June 13th. We had Jen as a henna artist. Mike and Mike were our caricaturists. They were all absolutely wonderful and very professional. I would hire them all in a heartbeat!!! They all did a great job and the kids loved them." "The kids LOVED Mark. He did an EXCELLENT job! Would love to have him again!" "The henna artists were great and everyone was happy with their work. They were both helpful and managed the busy area well. I still have my beautiful tattoo!" "The party turned out wonderful!!! [Face Painter] Katie was awesome, there were a lot of people at the graduation party, old and young and everyone enjoyed her work!!! Especially the use of the "blacklight paint" seeing as how it was a "blacklight" event!! She even stayed over and the process was a breeze thanks to your help! I will definitely be using your services again!!" "Everything went GREAT! Our graduates really enjoyed the caricaturist that you sent to our lock-in. He was very quick, personable and the students enjoyed the drawings that he provided. Again, thanks and we will definitely keep you in mind for our future events and pass you company on to others. Thanks again."